system in a cooling tower. To study the temperature distribution along the height of the tower. 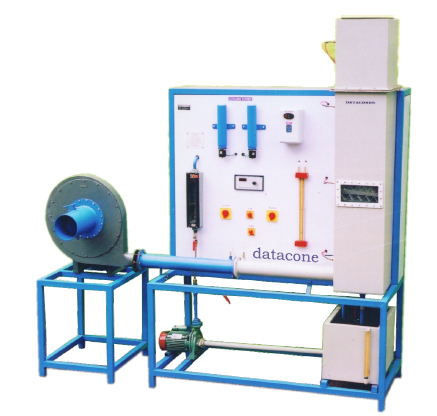 The experiments can be conducted at various flow rates of Air & Water & calculation can be made accordingly. Experiment can be conduct on both Induced & Forced Draught condition. To determine & compare the efficiency of the tower from Induced & Forced Draught condition. Cooling Tower size : 300 mm x 300 mm x 1200 mm. Packing : Expanded wire mesh (Two sets). Rotameter : 1.1 - 11 LPM to measure inlet water flow. Induced draught axial flow fan. Blower : Centrifugal type 3 HP. Orificemeter : To measure air flow. Switches for Pump, axial fan, heater,Etc. Main On/Off Switch for blower. 3.5m. (L) x 1.0 m (W).